Offering you a complete choice of products which include metal corner for books, book metal corner, metal corner, diary metal corner and brass metal corner. Driven by technically advanced facilities at our ultra-modern manufacturing unit, we are presenting an extensive range of Metal Corner for Books. Our offered eyelets are precisely manufactured by our brilliant professionals by making use of latest technology and factory-tested material in compliance with set universal norms. The offered eyelets are highly demanded in the market for their dazzling features like alluring designs, smooth surface and industry approved design. With rich industry experience and knowledge, we are manufacturing, trading and supplying a qualitative assortment of Book Metal Corner. The offered metal corner is manufactured by experts by using superior quality raw material and latest technology as per set industry norms. The stylish appearance and durability make our metal guard corners one of the most preferred choice of clients. Moreover, a team of our quality analysts conducts a series of quality tests on the entire range to seek out any possible defect. In tune with international standard, we provide the entire range in several customized options and industrial leading prices. To meet the diversified requirements of our prestigious clients, we are engaged in offering a qualitative range of Metal Corner. 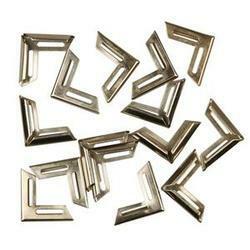 Our offered brass corners are availed in a variety of sizes, dimensions and other such specifications to choose from. 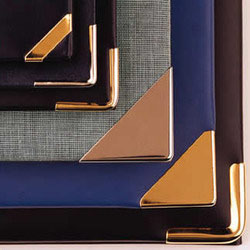 Our brass corners are extensively used by various clients owing to appealing look and excellent finish. The offered corners are precisely manufactured at our highly advanced manufacturing unit following industry defined guidelines. The offered range can also be availed from us at the industry leading prices within given span of time. 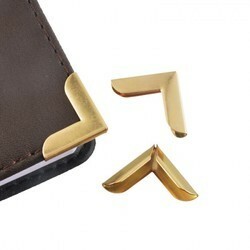 We are dedicatedly engaged in offering a commendable range of Diary Metal Corner. Besides being manufactured from high-grade raw material and latest technology, the offered diary corners are inspected properly by our competent professionals. Owing to features like durability and sturdiness, the offered diary corners are exceptionally valued by our precious clients. The offered diary corners are available with us in a multitude of sizes and shapes at affordable price. Our in-depth knowledge and industrial expertise enable us to offer a distinguished range of Brass Metal Corner. Our offered range is widely praised by our prestigious clients for their precise design and durability. These corners are extensively applauded by large number of clients owing to unique designs, unmatched quality and durability. Our provided corners are manufactured by a team of adept professionals using quality approved raw material and latest technology as per set industry norms.